Our Haunted Denver Ghost Tour is a family friendly activity that will take you on a walking tour to explore the fascinating history and ghosts of the city. A costumed guide will lead tour goers on a 1.5-2 hour journey through downtown Denver and reveal some of its most famous and creepy haunted stories. Tour goers will also be provided with their own ghost hunting equipment to use throughout the tour! Visit several of the oldest buildings in Denver and walk its historic streets, where the past may not be as buried as it seems. 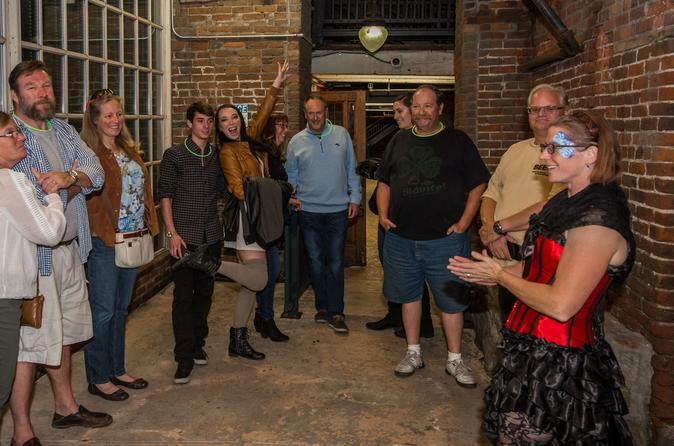 You will meet your costumed ghost tour guide at Tivoli Brewing Company (900 Auraria Parkway Suite 240, Denver, CO), the oldest brewery in Denver, for a private ghost tour inside their building. After leaving Tivoli, we will explore some of the oldest streets of Denver and hear chilling tales of western justice, violent accidents, and former residents who refuse to leave. We will visit several locations on the tour including a haunted hotel, Union Station and more! Tours last 1.5-2 hours and cover about 1.5 miles of walking. Our guide will also provide ghost hunting equipment for your group to use upon check-in. We will reveal the amazing history and tell tales of the spooky past inhabitants who still haunt this amazing town! The tour will conclude just a couple blocks from the starting point at The Celtic Tavern (1400 Market St).